Construction workers who are using spray or who are power sanding wood sealant are inhaling zinc nano particles that may have negative consequences on their health. To avoid long-term injuries and illnesses a recent study found that the use of a local exhaust ventilation reduces exposure to nano particles by 92%. A local exhaust ventilation also reduces the exposure to dust by 80%. The study was recently published in the Journal of Occupational and Environmental Hygiene. The authors of the study wanted to understand if zinc oxide nano particles contained in a wood sealant were detrimental to construction workers health while spraying the sealant or when sanding it. They conducted various tests during which a worker executed the tasks of spraying the sealant and sanding it in an environmentally controlled chamber. Various filters were installed to collect particles. Researchers also used instruments allowing them to count real-time particle levels. They found that globally the level of nano particles was high for both activities and that a local exhaust ventilation was effective in reducing nano particles by 92%. Researchers also wanted to know if many unbound nano particles of zinc oxide were released during the same operation. They used electron microscopy to analyze the collected samples. They found that most nano-sized ZnO particles were contained within or on the surface of larger airborne particles. More studies are necessary to understand which level of nanoscale ZnO is detrimental to construction workers health. Construction workers exposed to some types of nanomaterials may suffer lung injuries and other respiratory illnesses. For example, recent lab tests on rodents have demonstrated that unprotected respiratory exposure to carbon nanotubes (CNTs) can cause lung problems similar to those related to exposure to asbestos. 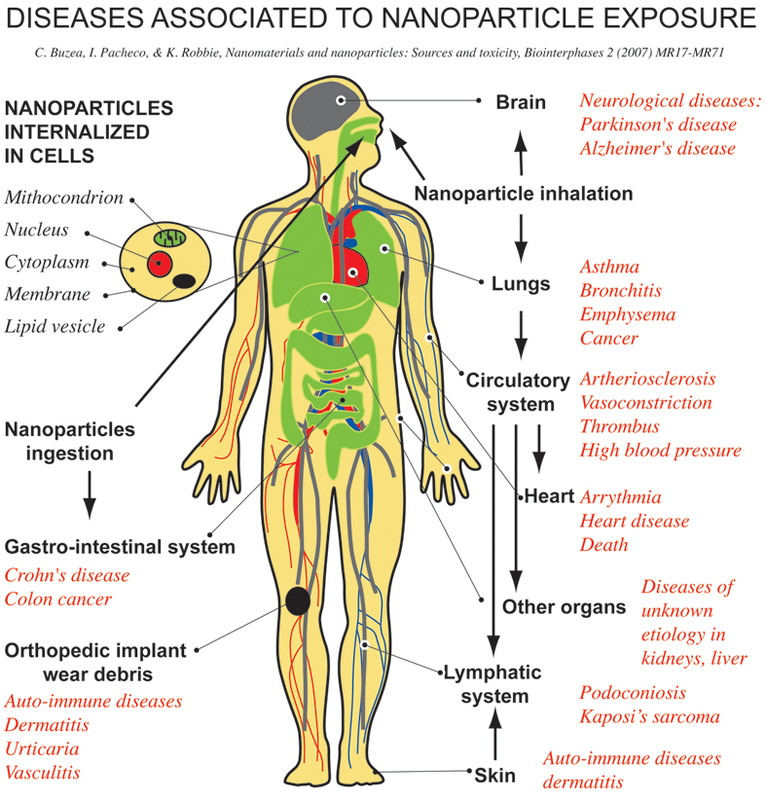 Because nanomaterials are relatively new, their risks are not well understood. Nanomaterials are present in many construction products such as coatings, lubricants, cements, adhesives, insulation and patching compounds.So far exposure to these products is not regulated and manufacturers have no obligation to indicate that their products contains nano-particules. The Center for Construction Research and Training (CPWR) is taking this new construction hazard very seriously and has created a database (http://www.nano.elcosh.org/) that features over 450 products that can be nano-enabled. The CPWR also recommends that construction workers use dust collection systems and wear a respiratory mask to protect themselves from construction injuries related to nanomaterials.